Unlike other Radio-centric VOIP technologies, such as Echolink or IRLP, etc, Allstar and the app_rpt/Asterisk technology have been specifically designed to be part of, and to link together parts of the very infrastructure of the radio systems that it implements, as opposed to be an end-to-end protocol like others. 144.920 N4LMC, CTCSS tone of 146.2, Node #46145. Located atop Signal Mtn providing a wide coverage area. Also broadcasts NWS alerts for Hamilton county in TN. 224.120 N4LMC, CTCSS tone of 146.2, Node #46530. Located atop Lookout Mtn providing wide area coverage. Also broadcasts NWS alerts for Walker & Dade counties in GA. There are also other nodes (46077, 46292 and others) that provide specific functionality such as hubs and/or links. PLEASE NOTE: In the event that the systems are linked to special nodes for weather events, DO NOT unlink or change the links during these events! If you want to use the telephone portal, where you can call into a node via a telephone, you will need to go register at https://allstarlink.org/portal/register.php. Once your registration is complete, go sign in and you will have been assigned a 10 digit pin code. The # in the US is 763-230-0000. See help here: https://allstarlink.org/support.html#telephoneportal. To see a list of all nodes, even ones that are offline go here: https://allstarlink.org/nodelist.php. To see a list of online nodes, go here: http://stats.allstarlink.org/. To get Q/A’s and help, just Google “allstar network” and there is tons of information out there. Remember, the system may be linked to more than you realize. Other nodes can be linked to us and those nodes as well as other nodes downstream from them can be linked… and so forth. 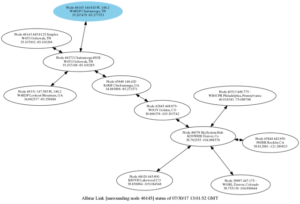 You can see who/what is linked online by going to http://stats.allstarlink.org/nodeinfo.cgi?node=46145. 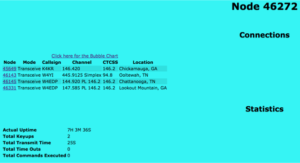 If you want to look at the full list of connections, click on the “Click here for Bubble Chart” link at top left of page. NOTE the direction of arrows between nodes, if the arrow is present on both ends of the link between nodes, it’s a a full transcieve link, if the arrow is present on only one end of the link between nodes, it’s a a receive only/monitor link. See the examples in the graphics below. Please always feel free to use the nodes as you wish, how ever, please also always be courteous to others. Check and see what is connected, make sure someone isn’t using the node, feel free to disconnect and connect what ever you want, but when you’re done… put it back like you found it. If you have any questions, feel free to email me and I’ll answer them the best I can.